I do not care if you are a giggling fanboy of Hizzoner Mr. Obama, or if you are his most ardent foe; the President and his court of jesters are making dreadful decisions, deadly decisions, decisions that could truly decimate (and MORE) the population of these United States. When I was in, oh, the sixth grade, we learned about the typhoid epidemic, and about the protocols that public health officials developed to track down Patient Zero, and then, all the potential exposed persons. Included in those protocols was quarantine. Later, "The Readers Digest" titillated its readers by detailing the selfsame methods used to track down those with syphilis and gonorrhea in attempts to deal with the incipient epidemic of STDs in the '60s and '70s. Point: we have a disease of frightening virulence being treated like a head cold. There is no effort being made to limit incoming travelers from Ebola hot zones. The CDC head his own self said "The right of return (via air travel-ed.) is more important than preventing disease.". Our borders are perilously porous, and should an outbreak reach Central America, there will be a flood of Ebola victims coming north to the cornucopia of medical wonders. I do not think that the President's feel-good whistling past the graveyard will prevent National Guard units and state militias setting up machine guns on the border facing south, and producing scenes that make Walking Dead and World War Z look like a Disney movie. "War on Ebola"? That will be the warfare, unless we can miniaturise submarines ad SEALS to fight the virus hand-to-hand. I call on Congress, and upon the President to cease giving a deadly virus civil rights, end air travel to and from hot zones like Liberia, and seal our borders. Mr. Kerry has said "We NEED open borders. We NEED unimpeded air travel (from Liberia, Sierra Leone, etc. -ed.)". Why? WHY? Why are these things needed? What purpose is served by these conditions? This putative need is not axiomatic; it is merely a step toward, a precursor to...what? Is the "what" worth an epidemic entering, being imported into our country, an epidemic which makes you bleed from every orifice? Does Mr. Obama wish to see his daughters bleed out before his eyes? Does he and his followers wish to see mass exsanguination of his fans and foes alike? Viruses are a-political; they just wish to use you as a vast reproductive organ. If our leaders do not begin treating this disease like a disease instead of as a privileged minority, well, we will be screwed. Article copyright © 10-14-14 Weatherly Hardy. Originally posted on Aardvarks' Plumbline blog. Disclaimer: Illustrations and the following links/opinions were added by Jay Agan. Yes, The Andromeda Strain book/film is science fiction. However it is no less relevant. The Andromeda Strain trailers here and here. This is the original 1971 production NOT the mini series. For all I know, the mini series has space aliens and PC crap messages about peaceful co-existence with microbes and viruses. 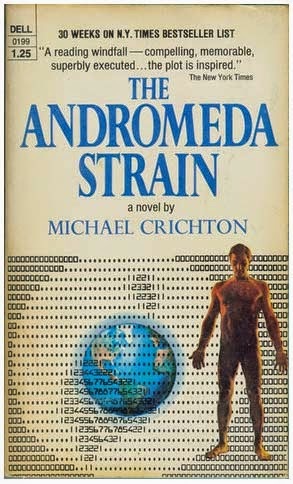 Wikipedia articles on The Andromeda Strain book here and 1971 film here. Full Metal Panic Fumoffu anime, episode 12, 5th Period Hotspot (Japanese with English subtitles.) here. Obama ... er ... Ebola is mentioned and they handle the situation better than the CDC ... at first. Aardvarks Plumbline Blog main page here. Aardvark Tees, Shirts Made of Win! here. Go to Jays' Tee Vee blog main page here. If ya' see any other articles under this 'un, you have arrived.